You can recognise a discussion list from the corresponding icon . To open the discussion list, click its name on the left margin. One workspace may have a large number of different discussion lists – make sure that you put your message on the right list! You can read the messages by clicking their names in the ‘Subject’ column. You can browse through messages by clicking ‘Previous’ and ‘Next’ at the top of the page. ‘Back to message list’ takes you back to the message list. You can reply to a message by clicking ‘Reply to message’. You can send a new message to the discussion list by clicking ‘Send a message’. You can select the recipient from the dropdown menu. Note, however, that the message can be viewed by all members of the discussion list. The recipient is simply the person to whom you direct your comment or question. Write the message header in the ‘Topic’ field and the message itself in the ‘Message’ field. Send the message by clicking ‘Send’. You can recognise ‘Chat object’ by icon. ‘Chat object’ allows simultaneous discussion in Optima. Free instant messaging services (such as Skype and Windows Messenger) can also be used for the same purpose. Please note: Only computers with an up-to-date Java driver can be used for the ‘Chat object’. The port 4444 in your own or in your organisation’s firewall must also be open. Otherwise you will receive an error message claiming that there is no connection. 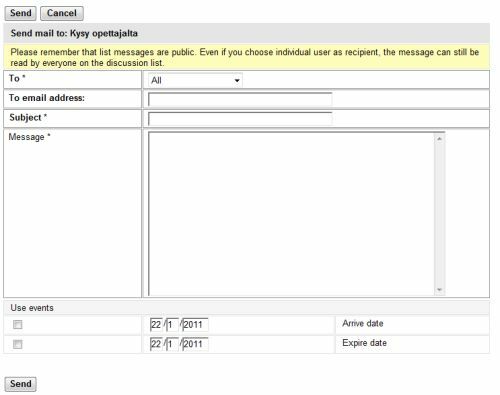 The names of the participants of the current chat session are displayed in the ‘Users currently in chat’ field on the left. All messages written can be viewed in the grey field on the right. Write your message in the ‘Message to all’ field in the bottom right corner and click ‘Send’. (If the message writing field is not visible, you are only authorised to read chat messages). You can send a private message to a participant of the current chat session by first clicking the name of the participant on the left and then the grey ‘Private message’ button at the top. By clicking the grey button again, you can return to general communication. By clicking the ‘Users’ link in the top left corner, you can see the names of those authorised to take part in the chat session. You can end the chat session by clicking the grey ‘Quit’ button.